"What we have built is only the beginning, a symbol of what we can achieve." Commander Zavala is an Awoken Guardian who serves as the Vanguard of the Titan class, and overall Vanguard Commander of The Last City. Stern and uncompromising, Zavala's only goal is to safeguard humanity within the Last City against all threats. He oversees all Guardian military operations, and led the Guardians to victory in both the Taken War and Red War. In the aftermath of both conflicts Zavala has become increasingly isolationist and reluctant to commit Guardians to conflicts outside of the Last City. "The first time I met Zavala, I was really intimidated. He's kind of a lot to take in, you know? But then we got to talking about the City and the Walls and how we're all going to die and the nine hundred things that want to wipe us out. And I realized he's actually much scarier than most people give him credit for." Zavala was revived by his Ghost into a Guardian inside a crashed spaceship along a shoreline with no memory of his past. He began a journey to the Traveler, encountering Fallen on his journey. During a battle against a Vandal, he was cut down and revived by his Ghost for the first time and claimed a Fallen spear as a weapon, but had to flee quickly when he spotted a Skiff landing nearby. After slaying another group of Fallen, one Vandal shot him in the back as it was dying, killing Zavala. Once his Ghost revived him once more, he found an auto rifle on one of the Fallen and took it with him. Once he reached the Traveler, Zavala discovered a small encampment of refugees below it with other Guardians acting as its defenders, including another Titan named Shaxx, and met a Warlock known as The Speaker as he preached around a campfire. Remaining in the encampment, Zavala aided refugees as they arrived, and soon the camp grew into a town and eventually became The Last City. When the City was assaulted by the Fallen, Zavala fought alongside Shaxx and his fellow Guardians to protect the citizens. When he spotted the Exo Hunter Cayde-6 and a group of civilians being chased by a pack of Vandals, Zavala used his Fist of Havoc to destroy the raiders. Following the battle, he helped construct walls around the Last City with the aid of other Guardians, including Shaxx, Ikora Rey, and Sloane. Zavala eventually became a student of Lord Saladin Forge. Later, after parting ways with Lord Saladin, he was a competitor in the Crucible. "The House of Wolves and the Awoken tore the Reef apart trying to get a tactical advantage. All the while, we were desperately trying to hold the Walls against the Devils, Kings, and Winter. It was one of the darkest chapters in the City's history." While the City was preparing for an assault by the combined forces of all the Fallen houses, tensions between the Speaker and Vanguard Commander Osiris reached a breaking point. Zavala, having recently become the Titan Vanguard by replacing Saint-14, attended a meeting of the Consensus without Osiris present. When the New Monarchy representative protested that Osiris was absent, Zavala announced that Ikora would be filling in for Osiris. The Speaker asked her to formally become the new Warlock Vanguard, and she agreed, and then proclaimed that he was exiling Osiris from the Last City. Zavala was then named as the new Vanguard Commander by the Speaker. When Zavala learned that the Hunter Anastasia Bray was investigating her past life, which Guardians were discouraged from doing, he confronted her in the Tower's plaza. He told her that in addition to the inappropriateness of keeping her previous life's name, he believed her research was causing her to neglect her duties to the Last City. Ana argued that her past was useful to the Last City and may be why the Traveler brought her back, but Zavala countered that she was brought back to be a Guardian and fight for the future. Their argument was interrupted by the Hunter Vanguard Andal Brask, who informed them that the Fallen were assaulting Twilight Gap. Zavala led the Battle of the Twilight Gap against the Fallen, fighting alongside Ana. She continued to try to convince Zavala that her research was worthwhile, but was attacked by a Fallen Captain. Zavala ordered her to fall back and attempted to cut down the Captain with his Thunderlord, but Ana was knocked off a cliff by the Captain and believed dead by Zavala and the rest of the Last City in the aftermath of the battle. Although the Last City emerged victorious at the Battle of the Twilight Gap, they had to deal with continued Fallen assaults, as the House of Devils laid constant siege to the City. In addition, the House of Wolves, which had been prevented from joining the battle due to Queen Mara Sov of the Reef attacking their fleet and starting the Reef Wars, carried out terrorist attacks on the City. Zavala fought against the Silent Fang, expert Wolf saboteurs who would sneak into the City and go on rampages in crowded residential districts. As Commander, multiple factions approached Zavala to try and gain his support. In particular, he was approached by New Monarchy via Executor Hideo, and was offered to be made king of the City if he had joined their faction, but he refused, likely not wanting to reignite the Faction Wars. He also turned away Arach Jalaal of Dead Orbit when he pleaded with Zavala for support. After the Vanguard learned that the Hive were not a myth and remained on Earth and the Moon, Zavala commanded the Last City's forces during the Battle of Burning Lake. The Vanguard barely won a victory there, but the Consensus began planning an invasion of the Moon to drive their ancient enemy away. As the Consensus met, Shaxx interrupted them and declared their intentions folly and that the Hive had weapons like none they had ever seen that required further study, like their Light-draining swords. As his old friend pleaded with Zavala to reconsider the invasion, he gently told Shaxx that this would be a matter for the Consensus to decide, not him. Zavala and the Consensus failing to heed Shaxx's warnings resulted in The Great Disaster, as thousands of Guardians perished attempting to retake the Moon for humanity. Zavala supported the Speaker's creation of a Lunar Interdiction that forbade anyone from traveling to the Moon in the hopes of restricting the Hive's movement. During a meeting of the Consensus, it was agreed that the Concordat and its leader Lysander would be exiled following their unsuccessful bid to overthrow the Speaker. Zavala agreed to handle the reassignment of the Guardians pledged to the faction, although he believed it would be difficult due to how loyal Lysander's followers were. The meeting then turned to a discussion of who should replace the Concordat on the Consensus, and Zavala supported the Future War Cult's inclusion, considering their focus on combat more useful to the Last City than dangerous. When his predecessor as Vanguard Commander, Osiris, tried to broker a contract between the City and a mercenary group of Titans called the Sunbreakers, Zavala found the terms of the deal unacceptable and rejected it, causing the Sunbreakers to hate the Vanguard and Zavala. In return, Zavala erased nearly every mention of the Sunbreakers from the City's records. Decades after the Battle of the Twilight Gap, Zavala learned that an individual was accessing the Bray Archive at the Fu'an Institute Library. He met with Owl Sector agent Camrin Dumuzi to inquire about the identity of the researcher, hoping that his old friend Ana Bray was still alive. Carmin protested that she was only supposed to be reporting to Quist, but Zavala informed her that he had been granted oversite over all Bray Archive issues. The Owl Sector agent informed him that the individual was named Staysa Pak and was just a civilian. Zavala sighed and sadly lamented that Ana must really be dead, causing Carmin to question who he was referring to. He deflected the question and told her that she had done a good job and keep him apprised if anything changed, unaware that Staysa Pak was an alias for Ana. "The Fallen will continue to claw at the walls of our City unless we strike them down. Beneath the ruins of the Cosmodrome, in the shadow of an old colony ship, we've located the House of Devils' Lair and the High Servitor feeding them their strength. We must destroy this machine god and send their souls screaming back to hell." Zavala greeted a newly risen Titan who had been revived by their Ghost in the Cosmodrome in Old Russia. After providing them with basic supplies and Glimmer, he noted that their weapon was an antique and sent them to get a new one from Banshee-44. When the Guardian returned, Zavala informed them that their ship had been restored by Amanda Holliday, but that they needed a warp drive so they could explore the system. He ordered them to return to the Cosmodrome and find a replacement. The Guardian succeeded in their task and killed Riksis, Devil Archon of the House of Devils. Zavala was impressed that such a new Guardian killed such a high-value target and decided to continue testing the Guardian by sending them back to the Cosmodrome to scout the Jovian and Terrestrial complexes to discover what the Fallen were doing there. He also suspected that the loss of an Archon would cause the Devils to increase protection around their Prime Servitor, Sepiks Prime. When the Titan reported back, Zavala learned that the Hive were infesting the Cosmodrome and that the Warmind Rasputin was alive and active there as well, but the Fallen were hunting for him. He thanked the Guardian for their work and asked them to speak with Ikora to continue looking for Rasputin and protect him from the Fallen. The Guardian's work with Ikora led to the reactivation of a terrestrial array in the Cosmodrome that Guardians aligned with Dead Orbit had failed to retake, although Rasputin took control of the array and used to connect with defense systems across the solar system. Zavala praised the Guardian for their success, and resolved to find some way to convince Rasputin to help the Vanguard in their wars. He also gave them their next mission, which he believed would test their limits: to form a fireteam and destroy Sepiks Prime, the Servitor that was the House of Devils machine-god and directed all their actions in the Cosmodrome. As the fireteam headed for the Devils' Lair, Zavala briefed the fireteam and stated that the Last City would never be safe unless the Fallen's leadership was eliminated. The team succeeded in their mission, and Zavala was pleased with Sepiks destruction, but stated that even though this would weaken the House of Devils, they would no doubt find other means to survive. When the Guardian returned to Zavala, the Vanguard Commander mused that the dream of a safe City was fragile, but their efforts had brought it closer to reality. Zavala asked them to enjoy the start of their legend as a Guardian, but to also know that their hardest battles still lay in the future. Zavala later learned that the Guardian slew Draksis, the Kell of the House of Winter, on Venus aboard his Ketch Simiks-Fel. He congratulated the Guardian and admitted that he felt glad about the demise of Draksis, who had led the House of Winter during the Battle of the Twilight Gap and continued to raid the Last City and its allies in the decades since. Zavala noted that while many Guardians were eager to explore the downed Wintership, he was content with another Fallen threat having been eliminated from the system and thanked the Guardian once more. "But in the Darkness rising, more fleets will come and new leaders will rise. We must be ready to face them all." Zavala attended the Speaker's address in the Tower plaza alongside Ikora, Cayde, and dozens of other Guardian's following the Guardian from the Cosmodrome's victory in the Black Garden and the destruction of the Black Heart. Despite this great blow against the Darkness, Zavala began preparing new operations to ensure the Last City's enemies did not have a chance to recover. He first turned his attention to the Cabal, as the Guardian's efforts to reach the Black Garden had drawn the Vanguard into a war with the Cabal on Mars, whether they wanted it or not. Zavala decided to eliminate their leadership one-by-one in order to liberate the lost city of Freehold from their grip, and selected Valus Ta'aurc as the first target. He dispatched the Guardian and a strike team to assassinate the leader of the Siege Dancers, directing them to his Imperial Land Tank in the Rubicon Wastes. Ta'aurc was killed by the strike team, and Zavala congratulated his Guardians, but warned them that although the Cabal were weakened, they were sure to send more fleets and legions to the system and that they must be ready to face them as well. With the Cabal dealt a great blow, Zavala turned his attention to the Vex. Meeting with Ikora, they discussed The Undying Mind, which was mentioned in riddles left by Osiris and Ikora feared was attempting to undo the destruction of the Black Heart. They were joined by Cayde, and together the three Vanguard leaders resolved to destroy the Undying Mind before it could lock the Black Garden out of time once more. Zavala alerted the Speaker of the situation and authorized a strike to eliminate the powerful Vex axis mind. "A Sunbreaker's fire has not been seen in the City for years. Their association with Osiris, the stupidity of our youth... it all seems so long ago." With the threat that the Taken posed to the solar system, Zavala began to consolidate all Vanguard forces and sought to rebuild relations with groups that had left or been exiled from the City. Amongst these groups were the Sunbreakers, an order of Titans who utilized Solar Light and had close ties to Osiris. Having rejected a deal with them long ago, Zavala now regretted that decision, and upon learning that a legion of them had been spotted for the first time in years in the Ishtar Collective on Venus, he requested that The Guardian serve as his representative and meet with them. Monitoring the Guardian's progress, Zavala detected a Sunbreaker beacon that was intermixed with a Vex signal and discovered it contained a message from Empyreal Magistrate Ouros ordering a retreat through a Vex gate and that the Sunbreakers had been there for a task related to Osiris. The Guardian subsequently learned that the Sunbreakers managed to open the gate and flee to their Forge on Mercury. As the Guardian headed to Mercury, Zavala admitted that he was responsible for the schism between the Vanguard and the Sunbreakers, and warned them that they hated Zavala. Tracing the Sunbreakers to The Burning Shrine, the Guardian impressed Ouros and was granted the power to utilize the Hammer of Sol, along with any other Guardian who proved worthy. The Guardian returned to Zavala, who lamented the exile of the Sunbreaker's and reflected on the mistakes of his youth. He was glad that their fire had now returned to the City and would once again keep it safe, strong, and warm. Zavala holding a Ward of Dawn to protect the Hall of Guardians staff from the Cabal barrage. "I mean live to fight another day. We don't have the luxury of rescue flights anymore. The longer we stay here, the tighter the noose." On the anniversary of the Battle of Six Fronts, the Last City and its Guardians were preparing to celebrate the unity of the City and foundation of the Vanguard. Zavala met with Ikora and Cayde in the Hall of Guardians when trouble with the Skyline Defense Systems was reported and the communications systems became blocked. He wondered if it was just the storm around the Last City that was interfering with their systems, but Ikora then reported that all of their satellites had been destroyed. As he peered into the storm, Zavala witnessed dozens of Cabal warships emerge from the clouds and ordered the entire City to battle stations. As the Cabal began to assault the Tower with a missile barrage, Zavala created a Ward of Dawn and ordered the command center's staff to take cover within. Zavala strained against the unending barrage, but held his Ward as the Hall of Guardians fell apart around them. Having survived the destruction of the Hall, Zavala, Ikora, and Cayde spread out throughout the Tower to protect and evacuate its staff. While Lord Shaxx gathered survivors in the hallways, Zavala rallied Guardians in the plaza as the evacuation shuttles ferried away survivors. The Young Wolf soon joined the battle, and Ikora contacted identified their attackers as the Cabal's Red Legion, an elite unit that had never known defeat. Zavala declared that the Red Legion had never faced Guardians before, but Ikora protested that the Red Legion was assaulting the Traveler. Despite this, Zavala ordered the Guardians to focus on the evacuation, and declared the Traveler would have to wait. The Young Wolf then joined Zavala in the plaza alongside other Guardians, and they held off several waves of Cabal until the last shuttle left, although Ikora reported that the Speaker had never made it onto his transport. Zavala ordered the Young Wolf to assist Ikora, but they discovered the Speaker had already been captured by the Red Legion. As Ikora pursued the Cabal, Zavala ordered the Young Wolf to meet Amanda Holliday's ship at the north tower so she could assist them in assault the Cabal flagship, The Immortal. As the Young Wolf infiltrated the warship, Zavala contacted Cayde and asked for his status, but the comms were breaking up and he barely heard that the Hunter Vanguard was low on ammo and his concern for Ikora. Zavala informed Cayde that no one had heard from Ikora since she followed the Cabal, and ordered his Guardians to form up on him. Zavala continued to fight alongside his Guardians in the City's streets until he received word from the Young Wolf's Ghost that The Immortal's shields had been disabled. Glancing into the sky, Zavala saw the Red Legion's flagship lose it protective barrier and ordered all units to concentrate fire on the vessel. As he leapt over his cover to launch himself at the Cabal, Zavala was about to let loose a rare smile when he felt an intense pain that knocked the air form his lungs and caused him to drop his weapon. Unsure of what happened, Zavala attempted to gather his Light and smash the Cabal with lightning, but found that he had been severed from the Light. His surprise allowed a Cabal soldier to shoot him in the side, sending him to the ground. Zavala despaired for a moment over the loss of the Light before finding resolve in the fact his Guardians and the citizens of the Last City were still depending on him to lead and fight. With a roar, the Vanguard Commander launched himself back to his feet, ready to fight and die for his people. Knowing the battle for the City was lost, Zavala began organizing a retreat from humanity's last stronghold and contacted Amanda for an extraction. The pilot angrily refused, noting she was not his chauffeur and that thousands of people like her were trapped in the City. Zavala understood her anger, but noted that with the Light gone, they were all the same now and that their chances to regroup decreased every moment they remained. He countered her argument that he could fly his own ship out of the City by noting she was the best pilot in the system and the only one who could keep their ships going after they retreated. She protested again that they could not just abandon the trapped civilians. Although he felt guilty for doing so, Zavala told her that he believed that humanity's only chance for survival was to flee now with who they could, which convinced Amanda to pick him up. The retreat from the Last City succeeded, but at a heavy cost. Seventy-three ships were destroyed attempting to break through the Red Legion's blockade, and the rest only made it through due to the Cabal's focus on Earth. Horrified by the loss of the City and the casualties suffered during the retreat, Zavala struggled to think of his next move, knowing only that he had to stay ahead of whatever Dominus Ghaul was planning. As he bemoaned his lack of information, Deputy Commander Sloane arrived, and the presence of his trusted second-in-command allowed Zavala to relax for just one moment. "The Golden Age cities of Titan were once the pride of humanity. We thought they were abandoned. But I was a fool to think the Hive would not spread this far." Zavala worked with Sloane and Amanda to find a rally point, and the three settled on Saturn's moon of Titan. Zavala began working on a message to be broadcast throughout the system to rally Guardians to Titan, but Sloane and Amanda disliked his initial recordings, noting he made it sound like they had already lost the war. Sloane wanted him to be more inspiring and present more of a plan, but Zavala refused to lie to his people and ordered the message to be sent out, believing that he owed them the truth at the very least. Upon arriving on Titan, the resistance secured a landing zone, but soon discovered that the New Pacific Arcology was infested with Savathûn's Hive, leading to many deaths among the Light-less Guardians. Sloane reported that both teams of Guardians sent to scout the facility were killed, but reported back that nearly the entire Arcology was occupied by the Hive. Zavala shot down her suggestion of storming the Arcology and stared up at the Hive Dreadnaught in Saturn's rings, lamenting on his choice to come to a moon that lay in the shadow of the City's greatest enemy and that the treasures of the Golden Age mattered little in the face of Hive demons. Sloane tried once more to convince him to assault the Hive, but he cut her off and order all Vanguard forces to fall back across the bridge to their landing zone and to post guards on their side of the bridge only before dismissing her. When the Young Wolf arrived on Titan to aid the resistance, Zavala warned them away, declaring that too many Lightless Guardians had already fallen to the Hive. However, their Ghost informed him that they had regained the Light, stunning Zavala. Sloane redirected the Young Wolf to the command center at Siren's Watch, and Zavala asked them to be careful in their assault. As they began their mission, Zavala explained to them why he had come to Titan, although he now bitterly regretted his decision. While the Young Wolf made progress, Zavala disagreed with Sloane's assessment that once they secured the control center they could plan a counter-offensive and be at the City's gates soon, noting it would not be so easy. After a Hive ritual was disrupted, the Young Wolf's Ghost suggested they should consult Eris Morn on which god they had been attempting to commune with, but Zavala revealed that no one had seen Eris, or Cayde and Ikora, since the Last City fell. After the breeding ground at the control room was cleared out, Zavala and Sloane flew to meet the Young Wolf there. As Sloane began setting up the command center, Zavala spoke with the Young Wolf on the landing platform, and expressed hope that if the Light had managed to find its way back to them, then perhaps it could be restored to the other Guardians as well. However, he was worried about what would happen before then, as many more Lightless Guardians would fall in the meantime, and wondered what they were without the Light. Shaking off his despair, Zavala directed the Young Wolf to restore power to the platforms by reactivating the New Pacific Arcology's wave energy convertors, which had been damaged by the Hive's occupation. After sending the Guardian into the New Pacific Arcology to procure a CPU to decrypt high-level Cabal transmissions, Zavala learns about The Almighty, a massive Cabal warship constructed to destroy suns and it has been placed outside of the Solar System's sun. While most despaired on the hopelessness of the situation, Zavala's resolve remains strong, declaring that with what was left of the Vanguard's forces, they would launch an assault on the Almighty but before he does so, Zavala states he needs his old fireteam. He needs Ikora and Cayde. Sending the Guardian to find the Hunter and Warlock Vanguard, they succeed in finding them while disrupting Cabal operations in the System. Zavala is reunited with his comrades on Earth at The Farm where they discuss a strategy to take down the Almighty, liberate the Last City and free the Traveler. He learns from Ikora that they cannot destroy the Almighty without causing a chain-reaction that would destroy the sun along with it. Nonetheless, Zavala suggests they get the Guardian on board to permanently disable the Warship while the Vanguards forces would sneak into the Last City to liberate their home and take down Ghaul. Cayde also provides a Vex teleporter that would allow them to reach the Dominus quickly. Hawthorne provides the means to sneak into the Last City and a plan to get the Guardian to the Almighty as well. The Guardian would steal the security pass and personal ship of Thumos, the Unbroken to reach the Almighty while Hawthorne aids the Vanguard. The Guardian succeed in disabling the Almighty which allows Zavala to initiate their attack to liberate the Last City. Despite having no Light to aid them, Zavala and the Vanguard's forces succeed in taking out Cabal troops and checkpoints but was almost killed by a Red Legion soldier. Thankfully, he was saved by Hawthorne, who thanks her and calls her a Guardian. As the Guardian returns to join the fight, Zavala and his team hold off the Red Legion as they get to their position while Cayde sets up the teleporter. The Guardian reached them, wounded but alive, and use the teleporter to infiltrate Ghaul's command ship, the Immortal, near the Cage. There the Guardian faces off and defeats Ghaul, ending the life of the Dominus. In the chaos, the Traveler awakens after centuries of slumber and restores the Light, driving the Red Legion from the Last City. Zavala gazes at the awakened Travel alongside Cayde, Ikora, and Hawthorne. "None of us will take the Speaker's place. And all of us will. We must find our own consensus now." With the City reclaimed and the Traveler awake, Zavala congratulates the Guardian while proclaiming this the start of new Golden Age for all humanity. As the fighting calmed down, Zavala and the Vanguard set up a new base near the ruins of the Tower while reinstating the Strike protocols to battle the enemies of the City once again. With the Speaker's death, Zavala became the acting head of the Consensus. At the first meeting of the Consensus held after the reclamation of the Last City, Executor Hideo protested that only a Speaker could call them to order, and Lakshmi-2 asked what the bylaws said about choosing a new one. Zavala informed them that there was no process for choosing a new Speaker, and Ikora suggested that they would have to create one. Until then, Zavala stated that they would move forward without a Speaker, with all the members of the Consensus having to work together without a formal leader to keep the City running and safe. After learning that Guardian Ariadne Gris had painted a dragon onto her Sparrow, the Dinas Emrys, the Consensus summoned her before them. Zavala demanded to know if she had been in contact with an Ahamkara, which she denied and insisted that she did it because dragons are cool. As the other members of the Consensus questioned Ariadne, Zavala asked for Ikora's opinion on the matter. Ikora admitted she was not paying attention, and joked that Ariadne obviously had not been in contact with an Ahamkara because she did not win in the Sparrow Racing League often. Zavala ended the inquiry by declaring that the Consensus' official stance on the matter was that the dragon symbol was cool. At a subsequent meeting of the Consensus, Zavala asked the Titan Callisto Yin to join them, and thanked her for saving the Firebreak Order's sacred Fire Victorious, lit by the legendary Titan Wei Ning, from Firebreak Plaza during the fall of the City. Hideo informed them that repairs to the Plaza were nearly done and the Fire Victorious could be returned in a relighting ceremony soon, but Yin informed the Consensus that the Fire Victorious would not be returning to the City in the same fashion as before. Each member of the Firebreak Order would now carry some of the fire with them in the shell of their Ghosts in order to spread Wei Ning's eternal flame to each battlefield they fought on. In the months after the Last City's liberation, Zavala began going through the Speaker's restricted files and learned many secrets that had been kept hidden from the Vanguard and Consensus. Among those files was the true location of Rasputin at the BrayTech Futurescape in the Hellas Basin on Mars, not within the Cosmodrome. The Speaker and Lord Saladin had deliberately misled Zavala and the others in order to keep Rasputin hidden and most of his power frozen beneath the ice caps of Mars, as they did not trust the Warmind. Now armed with the knowledge of Rasputin's role in the destruction of the Iron Lords, Zavala agreed with their fears and no longer viewed Rasputin as a potential ally, but rather a potential enemy that had become mentally broken following the Collapse. He was therefore alarmed when Ikora informed him that the Traveler's awakening had caused the ice caps to melt and begin revealing the BrayTech Futurescape and Rasputin's hub. Pouring over the files, Zavala discovered a secret entrance into the Warmind's vault and resolved to eliminate Rasputin personally and without informing Ikora or Cayde, as he believed Ikora would wish to use the Warmind's knowledge and ignore the dangers while Cayde was too busy filling the Prison of Elders. Upon arriving on Mars, Zavala discovered that he was not the only one searching for Rasputin, as Anastasia Bray was still alive and receiving assistance from the Young Wolf. The Vanguard Commander intercepted the wayward Hunter and the Guardian when they neared the Warmind's core, expressing disappointment in the Guardian for getting involved and anger at Ana for faking her death and not standing by the Last City against Ghaul and the Red Legion. Zavala believes that Rasputin is nothing but a broken weapon, too dangerous to be left alone but too unpredictable to use. He reasons that all previous attempts to make contact with the ancient Warmind was met with silence or hostility and as such, Rasputin cannot be trusted. Ana Bray, however, remains convinced she can communicate with Rasputin and that he will listen to her. However, their discussion is interrupted by tremors to which Zavala explains that the Warmind wasn't the only thing awakened by the Warsat impacts. A hidden Hive army, the Grasp of Nokris, has emerged to lay claim to Mars and destroy Rasputin in the name of the Worm God Xol, Will of the Thousands and its herald, Nokris, a heretic to the generic Hive and the disowned son of Oryx. Working together with the Guardian and Ana, Zavala comes up with a plan to lure Xol into a trap using something the Worm God cannot resist, a shard of the Traveler. The Guardian succeeds in acquiring a shard laced with Light and brings it to Mars. Ana meanwhile, continues to discuss her case in getting Rasputin to aid them, as she believes without the Warmind's power, Xol would be too powerful for the Guardian. Zavala remained unconvinced, believing that the Guardian would be able to handle it, as they have faced insurmountable odds before. However, as the Guardians reached the junction point of the caves beneath Mars where the Hive have made their fortress, they encounter Xol's herald, Nokris. The Guardians defeat the herald after a fierce battle but are nearly killed by the Worm God after it arrives to take the shard. With no other option and Xol nearing the Warmind core, Zavala goes with Ana's plan in using the Valkyrie Warmind weapon to kill the Worm God before it destroys Rasputin. Traversing through the facility to forge a powerful Valkyrie weapon, the Guardian battles with Xol outside the core and after a harrowing battle, they succeed in killing the Worm God. With the battle over, Zavala joins with Ana and the Guardian in entering the center of the core to speak with Rasputin directly. To his immense discomfort, the Warmind proclaims that it will define the realities of its own existence by stretching its reach across and beyond the system, ensuring that no threat will go unseen and that it will defend humanity but on its own terms. Ana Bray, however, reassures him that everything remains under control. From then on, while Zavala remains distrustful of Rasputin, he allows Ana and the Guardian to work with it to combat the warring factions in the system, principally what remains of Xol's forces on Mars. Over a year since the Guardians victory over the Cabal Red Legion and the end of the Red War, the Vanguard would ultimately and tragically lose a comrade. Within the Reef, a massive breakout within the Prison of Elders led to the release of not only countless deadly prisoners but also the freedom of the Fallen Scorn, undead and mutant Fallen. Cayde-6, the Guardian and Petra Venj arrived at the prison to contain the chaos but their mission ended in tragedy as Cayde found himself surrounded by the Scorn's Barons and his Ghost destroyed. Worse, the mastermind behind the breakout, Uldren Sov, executes the Hunter Vanguard with his own weapon, the Ace of Spades, before the Guardian or Petra could arrive to save Cayde. Upon returning his body to the Tower, Zavala mourns the loss of his comrade and friend with Ikora Rey. The Warlock Vanguard, enraged at Cayde's murder, demands that the every Guardian should arm themselves and storm the Reef to kill Uldren. However, Zavala refuses, citing the recent conflicts that have already reduced their strength and that they must focus on the awakened Traveler and the Last City instead of pursuing vengeance. Thus, Zavala is willing to let Uldren and his Scorn have the Reef. In addition, he feels that with the breakout and the inmates running rampart across the system, the Guardians are stretched too thin to hunt the rogue Awoken prince. As a result, despite Ikora's objections, Zavala declares the Reef a restricted zone. Nevertheless, the Guardian swears to take down Uldren Sov on their own. Before they left, Zavala stated that should the Guardian go to the Reef, then they would be on their own, without the support of the Vanguard. At the Tangled Shore, the Guardian would forge an uneasy alliance with the Fallen mob boss, The Spider, to aid them in hunting down Uldren and his Scorn Barons. One-by-one, the Guardian succeeded in striking down the Scorn Barons and ruining their unscrupulous plans. At the mysterious Awoken Watchtower, the Guardian finally managed to confront Uldren, only after destroying a Taken Chimera creature, the Voice of Riven. Weakened and at their mercy, the Guardian and Petra Venj complete their mission to avenge Cayde-6. Upon returning to the Tower, Zavala sternly states that while he does not shed a tear for Uldren's death and would've ended him personally in another lifetime, he believes that the Guardian risked much in storming the Reef on their own accord and that Uldren's death will have consequences in the future. After it was discovered that Queen Mara Sov still lived and that the Taken were invading the Dreaming City, Zavala listened to Paladin Kamala Rior as she addressed Guardians gathered in the Tower's plaza. The Awoken commander appealed for them to come aid the Reef's military in driving the Taken out of their sacred city in the name of a shared future, reminding them all that the Awoken had fought the House of Wolves and Oryx as humanity's shield, and in exchange she offered treasure and knowledge from the Reef for the Last City. 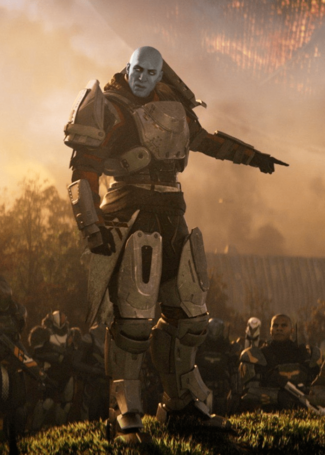 Zavala, despite his earlier reservations about getting involved in the struggle, called out that the Vanguard would stand alongside the Awoken of the Reef. Seeing the look of shock upon Rior's face, Zavala offered her an apologetic smile for not coming to their aid before. Resolute, experienced, strong and charismatic, Zavala is a perfect exemplar of the Titan class of Guardian and a gifted leader that leads the Vanguard with the utmost determination. Zavala's first priority is the protection of the Last City and takes that charge seriously. No matter what force that seeks the destruction of the Last City, Zavala would face that enemy head-on. His one true goal is to defeat the Last City's enemies and reclaim the Solar System. Zavala has complete faith in the Guardians purpose in defending those in need. For this reason, he doesn't approve of those who doubt the Guardians abilities while espousing the dangers of the Last City's enemies, such as Eris Morn. Despite this, Zavala finds the value and skills in everyone and will defer to their advice when needed. While Zavala is a capable, strategic leader, he can appear rigid and orthodox to others, especially Cayde-6, whose care-free attitude annoys Zavala to no end. While he would prefer people to follow orders and the chain-of-command, he will admit when an unorthodox strategy works. Though he can at times clash with Cayde, he nonetheless considers Cayde both a teammate and a friend. In contrast, he gets along well with Ikora Rey, though he has little patience for Warlock curiosity. The only time Zavala ever doubted himself and the Guardians as a whole was when the Last City fell to the Red Legion at the beginning of the Red War. As it was his duty to protect the Last City, Zavala felt he failed at everything he was meant to protect. Though he originally sought to counterattack, after losing Lightless Guardians to the Hive in a foolhardy attempt on Titan, did Zavala's spirit nearly break. He was even questioning if without the Light, was he even a Guardian anymore. It was only The Guardians efforts and learning of their restored Light did Zavala regain hope. Even after learning about the Almighty and its threat, Zavala's resolve remained strong, determined to defeat those who threaten the very existence of everything he knows. Zavala's overall confidence is restored after the liberation of the Last City and the awakening of the Traveler. A new conflicted side of Zavala emerges when his friend and comrade, Cayde-6 was murdered by the renegade prince, Uldren Sov and his Scorn Barons. Though Zavala heavily mourned his friend, he struggled with his personal desire for justice and his duty to protect the Last City. While he related to Ikora's stern demand to end Uldren for his crimes, as Zavala stated that he refuses to bury more friends, he knew that the Last City couldn't afford to conduct a manhunt. Despite this, the Guardian vowed to claim revenge by killing Uldren and the Scorn by taking the Reef in force. Though he declared the Reef out of their reach and reminded the Guardian of the risks their unsanctioned mission could bring, Zavala didn't stop the Guardian in their mission. Upon their success and the Scorn's failure, Zavala neither praised nor condemned the Guardian for their efforts, as he continues to be concerned over the consequences Uldren's death could bring. Despite this, Zavala is capable of admitting a mistake or realizing there was more going on than he initially suspected. Instead of a personal vendetta against a rogue prince, the Guardians uncovered dark plots that threaten not only the Reef but the Last City as well. When the Awoken begged for the Last City's aid, informing them that the Taken have invaded the Dreaming City, Zavala regretted in not taking action sooner and thus agreed to stand with the Reef. Commander Zavala serves as the Vanguard Tactician upon completion of the Red War campaign. Vanguard Tactician tokens earned from strikes can be turned into Zavala to receive Vanguard Tactician Engrams, which can reward Vanguard weapons and armor. "The Scout's reporting from Mumbai." "There is a difference between victory and invincibility." "Tell me, about their light." "What's wrong with these people?" "Didn't we have enough Kings after the Collapse? Have we forgotten our history?" "Despite it all, here we are." "What do they think of us? Do they think of us?" "One victory is not enough. Regard your soldiers as your children, and they will follow you into the dark." "Deploy the Fifth. The North West wall is weak." "The Traveler weakens while we remain idle." "What sort of game does Shaxx think he's playing?" "Every second we waste in idleness is a second lost to Darkness." "If we wait we die! But if we attack together we can take back our home, our light, our hope! Or we die trying"
"Whether we wanted it or not, we've stepped into a war with the Cabal on Mars." He is voiced by Lance Reddick. He seems to be familiar with the works of the ancient Chinese war general Sun Tzu, as he is heard paraphrasing The Art of War. His armor is the Jovian Guard, a PlayStation exclusive Armor set, although the symbols are different denoting his status as the Titan Vanguard. Zavala is a Mexican surname. Zavala has a hidden soft spot for knitting and crocheting, and got visibly excited when he was presented with a homemade sweater courtesy of Eva Levante. The Destiny 2 gameplay trailer revealed Zavala as a Defender Titan, utilizing the Ward of Dawn against enemy attacks even from overwhelming force such as missile barrages from Red Legion Warships. Earlier, during the Battle of Six Fronts, Zavala wielded Striker abilities against the Fallen. In the first mission of Destiny 2, Homecoming, when you're helping Zavala defend the Tower Plaza, it is possible for Zavala to die by having his Ward of Dawn shield give out early against the missiles fired by Dominus Ghaul's ship, although he can be revived by the player, or he'll respawn after three seconds. A younger Zavala arriving in the early Last City. Zavala during the Battle of Six Fronts. ↑ "One victory is not enough. Regard your soldiers as your children, and they will follow you into the dark."